Dr. Bradley Hall, O.D. is the main eye doctor for the independent optometry office in the Santa Rosa Costco. 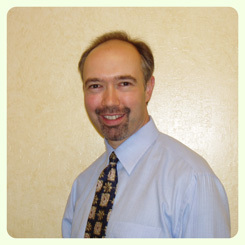 This page presents some of the testimonials we have received about Dr. Hall and our office. "My eye exam with Dr. Hall was the best experience I've had at the eye doctor in 25 years worth of appointments. All the staff were kind, helpful and genuine. Dr. Hall's attitude and demeanor can only be conveyed by saying that it felt like a visit to an old friend who was truly excited to help me see well. Somehow he made me feel like I was his first and only patient. Dr. Hall definitely stands out and above the rest. I highly and entusiastically recommend him!" - Laura E.
"As a new resident of Sonoma County, I initially chose Dr. Hall's office out of convenience. However, I have since been very impressed by the professionalism and friendliness exhibited by Dr. Hall and the office staff, as well as Dr. Hall's forthright approach to ophthalmic medicine. Of all the optometrists and ophthalmologists I have visited since I started wearing glasses in elementary school, Dr. Hall is clearly among the most thorough and knowledgeable. As a veterinarian, my job entails regular contact with people of the medical profession, so I especially appreciate Dr. Hall's frankness and honesty." - Joel C.
"I just wanted to let Dr. Hall know how much better my vision is with my new glasses and that I appreciate him working so hard to get them correct. It is unbelievable how much I can see that I couldn't see before and didn't realize what I wasn't seeing. Thank you very much Dr. Hall and I hope you have a great day." - Callie W.
"I had my doubts that an eye doctor at a large retail store would give quality eye care. Dr. Hall has proven me wrong. He has done an outstanding job for me at a very reasonable price. Thanks Dr. Hall for 20/20!" - John G.
"Dr. Hall was conscientious and knowledgeable about the procedure, and was always available to respond to my conerns about the recovery process. Dr. Hall also made suggestions to augment post-surgical healing, which I appreciated very much." - T.W. "I am extremely happy with my better vision. Dr. Hall referred me to LaserVue which was quite quick and efficient. I am very happy to not need to fool around with glasses or contacts again! I would recommend Dr. Hall to anyone." - Diana B. If you need further information or would like to schedule an eye exam, please call our office at (707) 570-2418. Please note that you do not need to be a Costco member to be examined by our optometrist eye doctor, and that other optometrist eye doctors are usually available to provide eye exams in our office on the days when Dr. Hall is not scheduled to see patients.